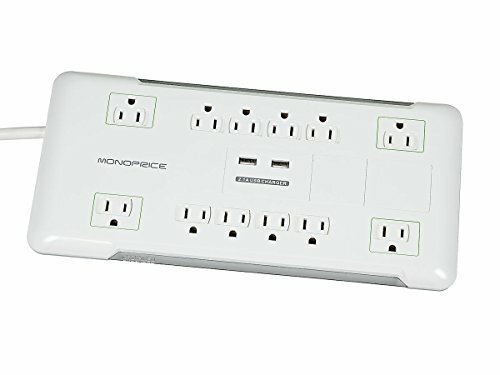 Protect your electronic equipment from damaging voltage and current spikes with this Monoprice surge protector.|This model includes twelve protected power outlets 4 of which are positioned for AC power adapters and a 2 port 2.1A USB charger. The clear plastic tabs on the sides of the unit illuminate green to indicate when the surge protector is providing protection to your equipment and when a proper ground is detected. When the protection circuitry has been fully consumed by power and current spikes the protection light will no longer illuminate indicating that the surge protector should be replaced. When the grounded tab is not illuminated it indicates that there is a problem with the house wiring and that the ground is not properly connected to the power outlet. The surge protector has 4 keyholes on the back allowing it to be secured to a wall or other surface. Features:|2 port 2.1A USB charger|12 protected power outlets|4320 joules of protection Power outlet safety shutters|6 foot power cord|2 in 1 power/circuit breaker switch Built in EMI/RFI filter|15A 1800 watts capacityUL/cUL rated. The surge protector has 4 keyholes on the back, allowing it to be secured to a wall or other surface. This model includes twelve protected power outlets, 4 of which are positioned for AC power adapters, and a 2-port 2.1A USB charger. Monoprice’s rugged design and rigid quality control standards deliver high quality products at fair prices.